The Mosquino board is intended to operate from very low-power sources, such as RF, vibration energy harvesting and small thermal gradients (e.g. body heat). Although the ATMega and the rest of the circuit can be put to sleep at < <1uA once they have reached legal operating voltage, many semiconductor circuits fail this test with too-low or slowly rising power supplies. For example, the datasheet for the MCP1703 voltage regulator shown claims a quiescent current of a couple uA (in regulation), but it actually peaks out at over 100uA just below its regulation voltage, and that's not considering any other circuitry living downstream. So, as a key part of this balanced breakfast, this is a simple UVLO (undervoltage lockout) circuit that will hopefully become standard in the next Mosquino rev. It should be guaranteed to draw <10uA over the full (0.0 ~ 11V) range, and in practice probably much lower. Two voltage thresholds, a “turn-on” threshold (Vh) and a lower “turn-off” threshold (Vl), determined by 3 resistor values, are defined by the user. (A reference voltage lower than either of these, Vref, is either provided by the user or comes for free with your comparator.) When a trickle of power is available, the input voltage charges up from zero until the higher, turn-on, thresold is reached, and this is then connected to the rest of the circuit (CPU, etc.). The circuit will be Doing Stuff, in some cases drawing more power than what’s coming in. In this case, the voltage at the input cap will begin to fall as power is consumed. The circuit gets cut off when the input voltage reaches the lower, turn-off threshold. The feedback resistor, R3, is effectively placed in parallel with either R1 or R2 depending on the comparator’s state, which has the effect of pulling the compared voltage (+ terminal of the comparator) up or down slightly. This makes the divided Vcc appear lower than it really is until the comparator turns on, and higher than it really is until the comparator turns off again (see the equivalent circuits above). The thresholds should be chosen such that the chosen power supply can actually (and reliably) charge up to the turn-on threshold, ideally in a reasonable amount of time. The turn-off threshold should be low enough (far enough from the turn-on threshold) that the turn-on current surge and any startup tasks don’t drag the supply all the way down to it and immediately turn your circuit off again. Needless to say, both should be within the circuit’s legal operating voltage range. 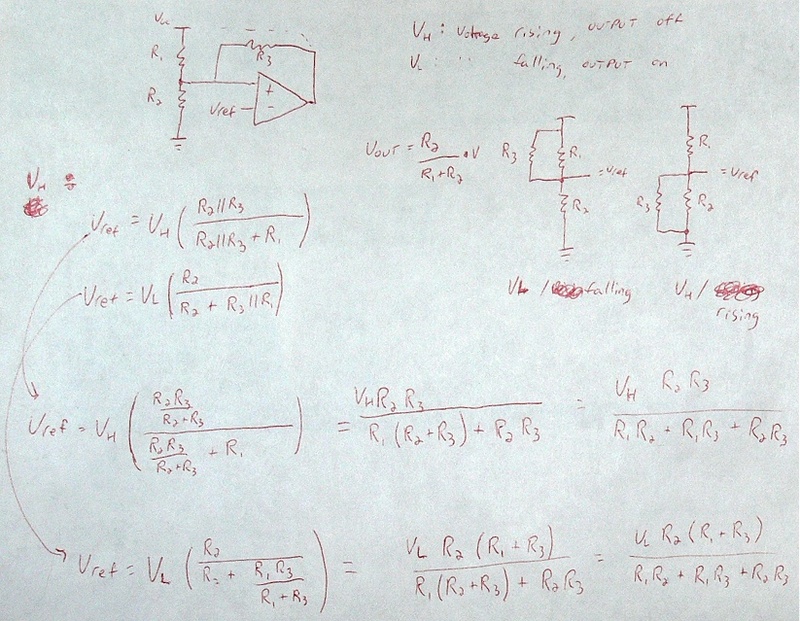 R1 and R2 are a voltage divider; their ratio sets the comparison voltage between 0 and Vcc. For our purposes let’s also consider R3 this way, so we are really computing a relative relationship between R1, R2 and R3 that makes your Vh and Vl work. An approximately infinite number of actual resistances would work as long as the ratios between them are correct; we can worry about actual resistance values later. 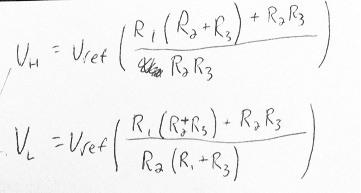 To make things simple we’ll define R3 = 1 and compute R1 and R2 relative to it. 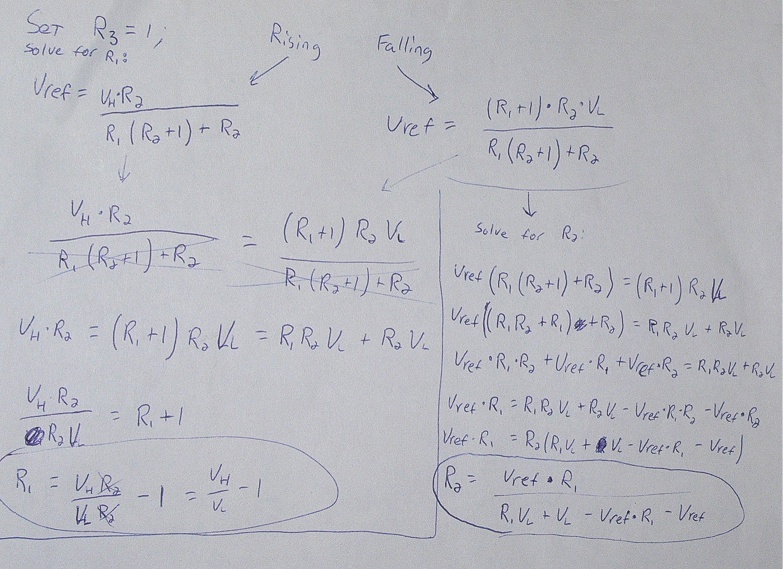 Here’s the math you need to do so (you can read the derivation below if interested). The part is guaranteed to operate correctly down to 2V, and in most cases will behave well below that. In my tests, it operated great down to about 1.4V. Below that, a spurious HIGH pulse on the output occurs from about 0.8 ~ 1.4V. For best results in the UVLO circuit shown above, be sure the FET it drives has a threshold voltage of at least 2V to guarantee the false signal will not be seen downstream. If that part is not available, a couple parts with similar specs exist (e.g. MAX9117-9210 series), but they are not pin-compatible.